Mineral output has been shrinking significantly in recent years due to judicial oversight of mining in key states such as Karnataka, Goa and Odisha. NEW DELHI: The government could go back to the drawing board to prepare a new industry-friendly law for the mining sector, in the process effectively junking a legislation drafted by the UPA government in 2011 whose provisions were unpopular with miners and, fortuitously for them, had lapsed with the previous Lok Sabha. The UPA government’s Mines and Minerals (Development and Regulation) Bill of 2011, which aimed to set aside an outdated 1957 legislation that presently governs the sector, makes it mandatory for miners to share their profits. That and a policy paralysis at the Centre had the mining industry worried about the UPA-drafted law’s contentious proposals that prescribed miners sharing 26% of their net profits with local communities affected by their mining operations. While the Union government has decided to push forward some pending and lapsed bills from the previous Lok Sabha, it is looking at mining laws afresh, said officials. This is in sync with the prime minister’s directive to all departments to review or repeal archaic laws that have outlived their utility. “The Mines and Minerals (Development and Regulation) Bill of 2011 had many issues but it has lapsed. The government is now taking a view on whether the law should be comprehensively amended or a new Bill be brought altogether,” said Arun Kumar, joint secretary in the mines ministry. A decision on the mining law’s fate is expected from the Minister of Steel, Mines and Labour, Narendra Singh Tomar, who is holding meetings with industry leaders this week. India’s mining output has consistently contracted for four years running. In the last financial year, it fell 1.4%. The problems afflicting the mining sector has had knockon effects on a range of other industry sectors too and the wider economy. Industries were forced to import raw materials even when they were plentifully available in the country. Industry officials who didn’t want to be identified welcomed the early thinking in the government to frame a new law. The 1957 law, they said, had little relevance in today’s context and needed to go. “The government should consider declaring mining as a strategic sector as it is critical for manufacturing growth, job creation and saving valuable foreign exchange spent on importing raw materials. 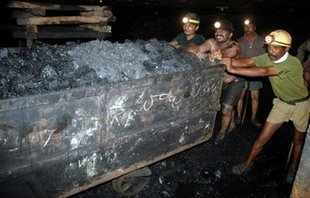 Moreover, it can propel growth in some of the most backward states,” said one mining industry official requesting anonymity. The Mines and Minerals (Regulation and Development) Act of 1957 was last amended in 1999 by the Atal Bihari Vajpayee government, which changed the law’s name to stress the primacy of development over regulation. Applicable to all minerals except mineral oil, the law originally reserved all major minerals like coal, lignite and iron ore for the public sector and allowed a limited role for private players in minor minerals. It was framed on the basis of the principles enshrined in the Industrial Policy Resolution of 1956, which was significantly overhauled in 1991 when India opened up its markets. In the 1970s, the law was amended twice, but only to enlarge the government’s control over mining operations and expanded the list of minerals reserved for the public sector. The UPA had enunciated a National Mineral Policy in 2008, but the MMDR law’s amendments to back the policy could not be passed. The amendments it had proposed included miners having to share 26% profit with local communities, setting up of courts to fasttrack illegal mining cases, a national mining regulator for major minerals and a central and state level cess on mining output.